[S64] Carolyn L. Bush Laird, The Bush Family As Descended from Richard and Mary Prescott Bush (n.p. : n.pub., 1987) p. 54. This typewritten, photocopied work was produced by Carolyn L. Bush Laird. A copy is in the Genealogy Collection, Texas State Library, Austin, Tex. [S64] Carolyn L. Bush Laird, [etc. ], above p. 54 (indicating that Edward Eidson was her father). [S64] Carolyn L. Bush Laird, [etc. ], above p. 54 (indicating that Edward Eidson was his father). [S64] Carolyn L. Bush Laird, [etc. ], above p. 54 (indicating that Edward Eidson was this child's father). [S64] Carolyn L. Bush Laird, The Bush Family As Descended from Richard and Mary Prescott Bush (n.p. : n.pub., 1987) p. 54 (indicating that Edward Eidson was her father). This typewritten, photocopied work was produced by Carolyn L. Bush Laird. A copy is in the Genealogy Collection, Texas State Library, Austin, Tex. [S64] Carolyn L. Bush Laird, [etc. ], above p. 54 (naming Elinor Bush as her mother). [S64] Carolyn L. Bush Laird, [etc. ], above p. 54. [S64] Carolyn L. Bush Laird, The Bush Family As Descended from Richard and Mary Prescott Bush (n.p. : n.pub., 1987) p. 54 (indicating that Edward Eidson was his father). This typewritten, photocopied work was produced by Carolyn L. Bush Laird. A copy is in the Genealogy Collection, Texas State Library, Austin, Tex. [S64] Carolyn L. Bush Laird, [etc. ], above p. 54 (naming Elinor Bush as his mother). [S64] Carolyn L. Bush Laird, The Bush Family As Descended from Richard and Mary Prescott Bush (n.p. : n.pub., 1987) p. 54 (indicating that Edward Eidson was this child's father). This typewritten, photocopied work was produced by Carolyn L. Bush Laird. A copy is in the Genealogy Collection, Texas State Library, Austin, Tex. [S64] Carolyn L. Bush Laird, [etc. ], above p. 54 (naming Elinor Bush as this child's mother). [S64] Carolyn L. Bush Laird, The Bush Family As Descended from Richard and Mary Prescott Bush (n.p. : n.pub., 1987) p. 54 (naming John B. Bush as her father). This typewritten, photocopied work was produced by Carolyn L. Bush Laird. A copy is in the Genealogy Collection, Texas State Library, Austin, Tex. [S64] Carolyn L. Bush Laird, [etc. ], above p. 54 (indicating that Mary Frances Miller was her mother). [S358] Carlee T. McLendon, comp., Edgefield Death Notices and Cemetery Records (Columbia, S.C.: The Hive Press, 1977), p. 258. [S64] Carolyn L. Bush Laird, [etc. ], above p. 54 (naming Elizabeth ['Betsy'] Bush as his mother). [S64] Carolyn L. Bush Laird, [etc. ], above p. 54 (naming Elizabeth ['Betsy'] Bush as her mother). [S64] Carolyn L. Bush Laird, The Bush Family As Descended from Richard and Mary Prescott Bush (n.p. : n.pub., 1987) p. 54 (naming Elizabeth ['Betsy'] Bush as his mother). This typewritten, photocopied work was produced by Carolyn L. Bush Laird. A copy is in the Genealogy Collection, Texas State Library, Austin, Tex. [S64] Carolyn L. Bush Laird, The Bush Family As Descended from Richard and Mary Prescott Bush (n.p. : n.pub., 1987) p. 54 (naming Elizabeth ['Betsy'] Bush as her mother). This typewritten, photocopied work was produced by Carolyn L. Bush Laird. A copy is in the Genealogy Collection, Texas State Library, Austin, Tex. [S64] Carolyn L. Bush Laird, The Bush Family As Descended from Richard and Mary Prescott Bush (n.p. : n.pub., 1987) p. 54 (naming John B. Bush as his father). This typewritten, photocopied work was produced by Carolyn L. Bush Laird. A copy is in the Genealogy Collection, Texas State Library, Austin, Tex. [S64] Carolyn L. Bush Laird, [etc. ], above p. 54 (indicating that Mary Frances Miller was his mother). [S358] Carlee T. McLendon, comp., Edgefield Death Notices and Cemetery Records (Columbia, S.C.: The Hive Press, 1977), p. 259. [S358] Carlee T. McLendon, comp., Edgefield Death Notices and Cemetery Records, above, p. 259 (stating that his grave marker includes a Confederate States of America marker). [S64] Carolyn L. Bush Laird, [etc. ], above p. 54 (naming Isaac Bush as his father). [S64] Carolyn L. Bush Laird, [etc. ], above p. 54 (naming Isaac Bush as her father). [S358] Carlee T. McLendon, comp., Edgefield Death Notices and Cemetery Records (Columbia, S.C.: The Hive Press, 1977), p. 259 (identifying her as wife of Isaac Bush). [S358] Carlee T. McLendon, comp., Edgefield Death Notices and Cemetery Records, above, p. 259. [S64] Carolyn L. Bush Laird, [etc. ], above p. 54 (indicating that Mary A. Amaker was his mother). [S64] Carolyn L. Bush Laird, [etc. ], above p. 54 (indicating that Mary A. Amaker was her mother). [S64] Carolyn L. Bush Laird, The Bush Family As Descended from Richard and Mary Prescott Bush (n.p. : n.pub., 1987) p. 54 (naming Isaac Bush as her father). This typewritten, photocopied work was produced by Carolyn L. Bush Laird. A copy is in the Genealogy Collection, Texas State Library, Austin, Tex. 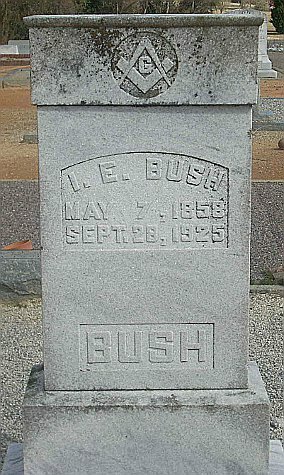 Isaac Eldred Bush's tombstone, Philippi Baptist Church Cemetery, Johnston, S.C., courtesy of Howard Burough. [S64] Carolyn L. Bush Laird, The Bush Family As Descended from Richard and Mary Prescott Bush (n.p. : n.pub., 1987) p. 54 (naming Isaac Bush as his father). This typewritten, photocopied work was produced by Carolyn L. Bush Laird. A copy is in the Genealogy Collection, Texas State Library, Austin, Tex. [S961] Find A Grave, online at http://www.findagrave.com, memorial for Isaac Eldred Bush, memorial no. 40152905, viewed on 4 Sep 2011. [S961] Find A Grave, online, above, memorial for Mamie A. Bartley Bush, memorial no. 49868681, viewed on 4 Sep 2011. [S961] Find A Grave, online, above, memorial for Thomas B. Bush, memorial no. 49869148, viewed on 4 Sep 2011 (naming Isaac Eldred Bush as his father). Mamie A. Bartley Bush's tombstone, Philippi Baptist Church Cemetery, Johnston, S.C., courtesy of Howard Burough. 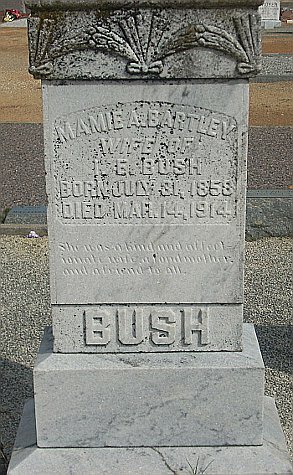 [S961] Find A Grave, online at http://www.findagrave.com, memorial for Mamie A. Bartley Bush, memorial no. 49868681, viewed on 4 Sep 2011. [S961] Find A Grave, online, above, memorial for Isaac Eldred Bush, memorial no. 40152905, viewed on 4 Sep 2011. [S961] Find A Grave, online, above, memorial for Thomas B. Bush, memorial no. 49869148, viewed on 4 Sep 2011 (naming Mamie A. Bartley Bush as his mother). [S64] Carolyn L. Bush Laird, The Bush Family As Descended from Richard and Mary Prescott Bush (n.p. : n.pub., 1987) p. 54 (naming William B. Bush as her father). This typewritten, photocopied work was produced by Carolyn L. Bush Laird. A copy is in the Genealogy Collection, Texas State Library, Austin, Tex. [S64] Carolyn L. Bush Laird, [etc. ], above p. 54 (indicating that Elizabeth Burgess was her mother). [S357] Carlee T. McClendon, Edgefield Marriage Records, Edgefield, South Carolina, from the Late 18th Century up Through 1870 (n.p. : n.pub., 1970), p. 94 (attributing information to "family records"). [S64] Carolyn L. Bush Laird, [etc. ], above p. 54 (giving only the year). [S357] Carlee T. McClendon, Edgefield Marriage Records, Edgefield, South Carolina, from the Late 18th Century up Through 1870 (n.p. : n.pub., 1970), p. 7 (attributing information to "family records"). [S358] Carlee T. McLendon, comp., Edgefield Death Notices and Cemetery Records, above, p. 259 (giving her name as Mrs. Talitha Autry). [S64] Carolyn L. Bush Laird, [etc. ], above p. 54 (not giving the date or place). [S357] Carlee T. McClendon, Edgefield Marriage Records, Edgefield, South Carolina, from the Late 18th Century up Through 1870 (n.p. : n.pub., 1970), p. 15 (attributing information to Edgefield Advertiser). [S64] Carolyn L. Bush Laird, The Bush Family As Descended from Richard and Mary Prescott Bush (n.p. : n.pub., 1987) p. 54 (not giving the date or place). This typewritten, photocopied work was produced by Carolyn L. Bush Laird. A copy is in the Genealogy Collection, Texas State Library, Austin, Tex. [S64] Carolyn L. Bush Laird, The Bush Family As Descended from Richard and Mary Prescott Bush (n.p. : n.pub., 1987) p. 55 (naming William B. Bush as her father). This typewritten, photocopied work was produced by Carolyn L. Bush Laird. A copy is in the Genealogy Collection, Texas State Library, Austin, Tex. [S64] Carolyn L. Bush Laird, [etc. ], above p. 55 (indicating that Elizabeth Burgess was her mother). [S64] Carolyn L. Bush Laird, [etc. ], above p. 55. [S64] Carolyn L. Bush Laird, The Bush Family As Descended from Richard and Mary Prescott Bush (n.p. : n.pub., 1987) p. 55 (naming William B. Bush as his father). This typewritten, photocopied work was produced by Carolyn L. Bush Laird. A copy is in the Genealogy Collection, Texas State Library, Austin, Tex. [S64] Carolyn L. Bush Laird, [etc. ], above p. 55 (indicating that Elizabeth Burgess was his mother). [S64] Carolyn L. Bush Laird, The Bush Family As Descended from Richard and Mary Prescott Bush (n.p. : n.pub., 1987) p. 55 (indicating that William Carter was her father). This typewritten, photocopied work was produced by Carolyn L. Bush Laird. A copy is in the Genealogy Collection, Texas State Library, Austin, Tex. [S64] Carolyn L. Bush Laird, [etc. ], above p. 55 (naming Nancy Bush as her mother). [S64] Carolyn L. Bush Laird, The Bush Family As Descended from Richard and Mary Prescott Bush (n.p. : n.pub., 1987) p. 55 (indicating that William Carter was this child's father). This typewritten, photocopied work was produced by Carolyn L. Bush Laird. A copy is in the Genealogy Collection, Texas State Library, Austin, Tex. [S64] Carolyn L. Bush Laird, [etc. ], above p. 55 (naming Nancy Bush as this child's mother). [S64] Carolyn L. Bush Laird, The Bush Family As Descended from Richard and Mary Prescott Bush (n.p. : n.pub., 1987) p. 55 (indicating that William Carter was his father). This typewritten, photocopied work was produced by Carolyn L. Bush Laird. A copy is in the Genealogy Collection, Texas State Library, Austin, Tex. [S64] Carolyn L. Bush Laird, [etc. ], above p. 55 (naming Nancy Bush as his mother). [S64] Carolyn L. Bush Laird, The Bush Family As Descended from Richard and Mary Prescott Bush (n.p. : n.pub., 1987) p. 55. This typewritten, photocopied work was produced by Carolyn L. Bush Laird. A copy is in the Genealogy Collection, Texas State Library, Austin, Tex.